During Willie Irvine’s childhood, his large family often struggled to make ends meet, not helped by the tragic death of his father when Willie was only eleven months old. While he said his home life was generally happy, the many privations his family endured sharpened Willie’s hunger for success on the football field. Remarkably, he became as predatory in the English top flight as Jimmy Greaves. In 148 senior appearances for Burnley, including four as a substitute, Willie scored 97 goals, emulating Greaves’ two in three strike-rate. Like Greaves, Willie scored in his First Division debut, a bullet-header in the Clarets’ 3-2 win at Arsenal in May 1963. Three days later he registered his first senior hat-trick in a home Football League game against Birmingham. 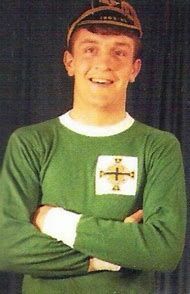 By then he had his first senior cap for Northern Ireland, playing in a Home International against Wales, in April 1963, alongside his goalkeeper brother and Jimmy McIlroy. Alas, Wales won 4-1 with a Cliff Jones hat-trick. While injury and the impressive performances of Lochhead and Robson kept Willie out of the first team for most of the following season, a late flourish of first team goals, including a brace in a 7-2 demolition of Spurs, provided some consolation. But it was during Burnley’s disappointing 1964/65 season that Willie came into his own. His partnership with the bustling, brawny Andy Lochhead realised 43 League goals, Willie top-scoring with 22. Better was to follow in the 1965/66 season which culminated with Burnley securing third place with a similar number of points (55) to that achieved by the 1959/60 title-winners. Burnley duly qualified for the European Fairs Cup competition of 1966/67. Willie netted 29 league goals during the 1965/66 campaign, while his battering ram partner, Lochhead, contributed 15. Their prolific partnership delivered fifty-six percent of their team’s 79 league goals. Some successful scoring partnerships are founded on mutual antagonism – take Andy Cole and Teddy Sheringham, for example. However, Lochhead and Irvine became long-lasting friends, sharing nights out and holidays together. In two and a half seasons as Burnley’s twin strikers, Lochhead and Irvine netted 118 First Division goals. Whereas Lochhead had immense strength, contesting any challenge in the air or on the ground with shuddering intensity, Irvine was a ‘will of the wisp’, with a sharp eye for an opening. Irvine reckoned he had “feet as quick as Cassius Clay” (Muhammad Ali). Irvine put himself about in a scurry, insinuating himself into the tiniest of spaces to get a shot away, heaving himself above defenders with perfect timing to produce flashing headers. He would get up the noses of his opponents, too, with his cocky strutting, and brash, ‘gobby’ manner. The mind-games matter as well as the quick feet. Like the very best strikers he was always ready to pounce on the half-chance, eyes keenly alert, primed nerve ends sparking, leg muscles twitching in readiness, coiled to make that explosive spurt, just enough to put him ahead of his markers. It didn’t need to be much. At this level, the slightest margins can be decisive. 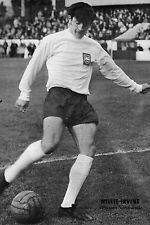 During his international career, he capitalised upon the brilliant service supplied by his friend, George Best, in netting eight international goals in 23 appearances. Alf Ramsey regretted Irvine’s unavailability for England. The lad who had started life with little looked set for the richest prizes football could bestow. By 1966, Irvine was a big name in British football, but his future promised even greater acclaim. Then, on 31 January 1967, Irvine’s world caved in. His leg was broken in a petulant FA Cup tie at Everton. One witness said: ‘It was a horror tackle. 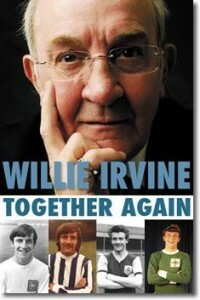 The crack was audible even at the back of a packed Goodison stand.’ Irvine was aged just twenty-three. After the game, Harry Catterick, the Everton manager, came into the Burnley dressing room. Willie expected an apology. He didn’t get one. Irvine said: ‘[Catterick] told me that it served me right, that I’d got what I’d been asking for.’ There had been much bad blood between the teams. With both Lochhead and Irvine then side-lined by injury, Burnley’s European Fairs Cup campaign faltered. Gradually, the break healed but Willie began to limp half an hour into a game. He fretted, fearing for his future. It spoilt things at home. The team wasn’t doing so well, either, letting in a lot more goals. There was a spat between chairman, Bob Lord and his team mate Gordon Harris, resulting in Harris being moved on. The fracas poisoned the air. Willie began to bridle at Burnley’s exacting coach, Jimmy Adamson. As his confidence fell, the niggling got worse. Irvine claimed: ‘Adamson just gnawed away at me. It festered in the back of my head… I couldn’t play for him… His coaching was excellent, studious, thoughtful and creative. As a tactician he was outstanding… but I just couldn’t relate to him.’ The goals began to dry up – down to one in three, a good rate for many strikers, not for Willie though. He was no longer an automatic selection. He looked for a way out. But in Willie’s desperation to leave, he didn’t look before he jumped. He said he had no idea how badly placed Division Two Preston were. But he still signed for them. This was in March 1968. Preston paid Burnley £45,000 for him. Willie received a £5,000 signing on fee and a regular £75 per week wage plus appearance money. This was £15 more a week than he had received at top flight Turf Moor. Preston could barely afford this, but they couldn’t afford a further relegation, either. Willie offered a prospect of a ‘get-out-of-jail card’. He delivered quickly with a hat-trick against Huddersfield. Preston survived. In the soggy autumn of 1968 I met Baz, possibly Irvine’s most fervent fan. Baz was an evangelist, a voice growling in the college wilderness. He wanted to share his homage of Willie with everyone. Like a zealous, bigoted, Bible-belt preacher, he saw no reason to recognise others’ privacy or priorities, never picking his moments. He was a wild boor. And yet the college women indulged him, much like an unruly, licks and paws, young retriever. One day, he lurched drunkenly into the room my girlfriend shared with another female student. He didn’t knock. He just barged in clutching his small tin of Nescafe, which he considered to be his swipe card. Seeing me sitting on a bed, he narrowed his eyes, studying me blearily while rocking unsteadily on his heels. He inquired in a gentle Lancashire growl whether I had ever seen Willie Irvine play. I said I had, at Spurs. He contemplated that briefly before continuing in a deeper, louder, gruffer voice: “Then you’ll know … (and here he paused, hitching himself up like a long jumper) how fooking ex-cel –lent he is, won’t you!” He bit down on his bottom lip before he swore, spring-loading it, so he could propel his expletive at maximum velocity. It was as if he was vomiting the profanity, stumbling forward with the force of his delivery. It was world class vulgarity. Baz once blagged his way onto a London-bound coach transporting anti-apartheid protesters to a demonstration. This was a new departure for him. Strong views he had aplenty, political issues, no. But then we twigged. His purpose was to get to the FA Cup replay at Stamford Bridge. Heaven help those protesters once Baz got going. And on the return journey his gruff voice would have been gruffer still, after 90 minutes of furious invective. It was how Baz became known as Deepdale Throat. Baz was deeply disappointed. Chelsea snatched a late victory and, worse still, Willie was badly maimed. Some years later Willie told me that Chelsea’s rugged centre back, David Webb, caught him in a scissor tackle, immediately rupturing his cruciate ligament. The injury was not properly diagnosed, he said, resulting in calcification in the knee joint. It brought Willie’s promising Deepdale career to a limping close. With Preston so reliant upon Irvine’s goals, his invalidity consigned them to Division Three a year later, depriving North End’s highly respected manager, Bob Seith, once an eminent Burnley half back, of his job. Willie had a brief Indian summer at Brighton, helping them achieve promotion to the Second Division in 1972, but thereafter his career petered out quickly, first at Brighton, then at Halifax and finally at non-League Great Harwood. After Willie’s adversity and Preston’s relegation, I never saw Baz again. Although his beloved North End returned quickly to the Second Division under Alan Ball senior, I doubt whether their attritional style fired him as much as Willie’s performances had before Irvine’s cruel demise.